What About Clients? : Here's a book we'll buy and read. Here's a book we'll buy and read. And not just because of the compelling title. It's by Newport Beach trial lawyer and writer J. Craig Williams of May It Please The Court. It covers, in an irreverent way, how "real life" becomes "real litigation". Ninth Circuit Chief Judge Alex Kozinski has written the book's foreword. 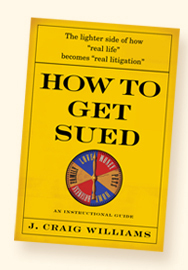 How to Get Sued: An Instructional Guide is already hitting best seller lists--and it's not even out yet.